After thinking about it and finally signing up, on Sunday I was up with the lark to drive to Woburn Abbey to cycle with 600 other ladies at Cycletta. I was feeling a little nervous but it was bright and sunny and with my padded knickers and cycle helmet on I was ready to give it my best shot. As we headed off, the first 15km was much more hilly than I had expected from the flat course that had been described and I started to question whether I had bitten off more than I could chew as scores of women overtook me. But at the treat stop after the steepest hill, I was relieved to hear that was the worst of the hills over with. The scenery was breathtaking, the yellow rapeseed fields were glowing in the sun and contrasting beautifully with the lush greenery courtesy of the recent rain. On the flatter sections of the course I was able to look around and really enjoy it. There was a nice sense of camaraderie with women shouting ‘Pothole!’ to warn those behind them, ‘Treat stop in 100m!’ to keep everyone going and ‘Coming past on your right!’ to let you know they were there. As I began my second lap of the course at around 32km there wasn’t another cyclist in sight. Just when I had convinced myself I’d gone the wrong way I would see one of the friendly marshalls or one of the motorcycle ride rescue crew, so I was left thinking that all the other cyclists had finished. I had expected to finish last so I wasn’t too upset, I was just hoping that they hadn’t packed up the finish line by the time I got there. Then about 15km before the end I started catching up and even overtaking a few ladies and when I stopped to grab some water and a Jaffa Cake 13km before the end, I saw loads of women catching their breath at the treat stop. It was all the motivation I needed to hop back on my bike and carry on. When I got to the finish line and saw my husband and daughter cheering, and the look of surprise on their faces that I wasn’t pushing my bike, I felt elated. I finished the 60km course in three hours and twenty-six minutes which is by no means fast, but I came in 52nd place out of 76 cyclists. I’m so pleased I cycled all the way, as I’ve mentioned before I’m not naturally the sportiest of people and I’ve never spent three and a half hours doing anything physical in my life (barely even in labour). 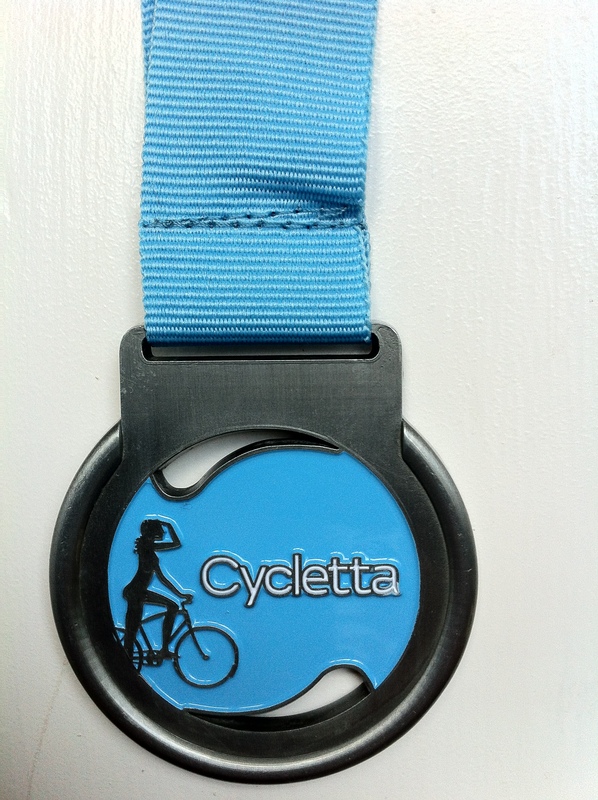 Now my knees have almost stopped aching I’m hankering to sign up for another Cycletta ride this year. Wow! Well done you, that’s a great achievement. You’ve inspired me to dig out my running shoes again. There’s no room for another bike in this house, what with the 3 children’s taking up all the space.